This little scene is way easier than you think – I dare you to try it! 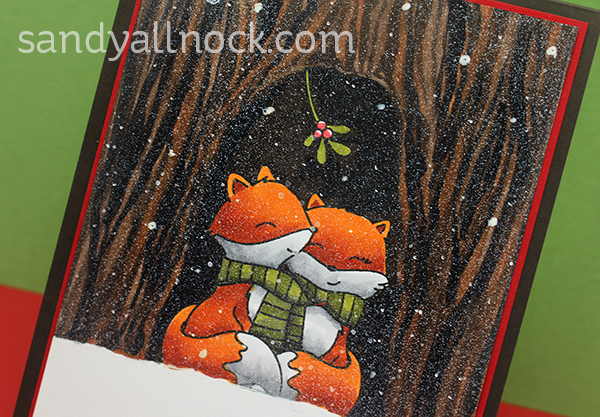 These foxes are perfect for it but think about other stamps you have that could create this scene. Be sure to tag me on Instagram, I’d love to see what you create! Watch the video below or click HERE to see it in HD on YouTube. Hi Sandy I had a go at this card and it came out beautifully, I would very much like to post it to my blog but I didn’t want to do so without your permission.I have this stamp set and did excatly the same as yourself with the exception of the berries, I left the mistletoe berries white. How adorable is this little couple !! Your card is so adorable! Thank you so much for showing how to do the background and making it look so easy! I will definitely have to give it a go soon. Thanks so much for the inspiration! Beautifully done as always, I love the spritz of white over the scene, it really does look like fine snow. You have such great ideas. Foxy red like the painter! So pretty. Love this and everything you do. I always pick up a tip/trick from your videos. Thanks! Awsome scene, you call it a little scene but I think it makes a huge part of the card. I love it! The foxes are adorable and yes, I think they share a scarf. Thanks for your time and effort. Lovely and cute card ! What’s not to like about this card? It is so cute and festive. I so appreciate your enthusiasm that you share with all of us paper crafters. You inspire me at 85 yrs. of age to continue on my journey making cards, etc. Love it! I’m excited to try making the tree. Super COOL foxy scene! Thanks for the video! This is really adorable! I love the easy way you colored the fox couple, and that background is amazing! Beautiful! Great wood grain technique and video! Thanks for sharing. Another great card with lots of techniques to learn – thanks for sharing! They say a day when you learn something is a good day. Any day Sandy releases a video is thus a good day. 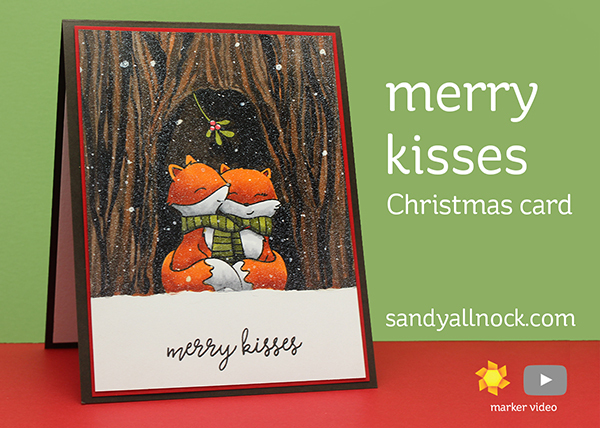 This is a darling card and amazing fun to watch that background come together. Thank you for this good day. Glad to see you are still at it Sandy. Always love to see your work. Simply adorable, Sandy. Your background does seem easy to create, if you do it lol, and I love the look of thr spray stain.